Just as furniture is cheaper in times of war, so stock portfolios are easier to fill during an economic crisis. But, while in past downturns investors generally shunned developing markets in favour of more reliable stocks closer to home, many are now advocating once high-risk regions as the route to investment stability. Top of the pile of countries ready to reverse traditional wisdom is Russia, at least according to its finance minister, Alexei Kudrin. "The Chinese word for crisis," remarked John F Kennedy, "is composed of two characters: one representing danger, the other opportunity." Though he did not quote the American President directly, it was exactly these sentiments that Kudrin attempted to convey during his address at the World Economic Forum in Davos. Kudrin could barely contain his glee as he projected a new image of Russia as the safe haven for wily investors during times of global crisis. "Interest in Russia as an island of stability is bound to grow," he said. "The US economy is sliding into recession and global economic growth is slowing down." Minister Kudrin's line was not helped by events back home. While he was speaking, the main RTS index back in Moscow veered off script and plummeted 3.9pc, and was set to fall further. But recent practice has seen the Russian stock market take a 10-15pc plunge every six to nine months, only to soar higher still. And there was certainly no reason to suggest it would not do so again. Kudrin has reason to be pleased himself, being part of the reason why the Russian government has long overturned any reputation of fiscal irresponsibility. In 2008, the federal budget is expected to show a surplus which projected indicated will reach some $43.8bn (^29.9bn). This surplus will augment Russia's already significant gold and foreign currency reserves. As of January 2008, the Central Bank is $476bn in the black, while the government's much-touted "stabilisation fund" stood at $157bn. 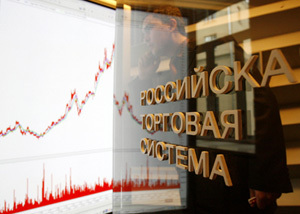 Structurally, Russia is also well placed to withstand a global downturn. Its reliance on exports of commodities, energy, mineral fertilisers, round timber and other raw materials - once cited as a weakness - is in more unstable times likely to prove an advantage. While consumption of industrial and consumer commodities may fall in times of recession, the world will still need agricultural and industrial raw materials. And as a global supplier of raw materials and semi-finished goods, neither is Russia's export market overly dependent on the US, whose economy has been hit most painfully, or on the markets of finished goods in general, which would be most vulnerable to a worldwide downturn. Russian growth is also driven in large measure by domestic demand. Much of the current GDP growth, for example, is centred not on commodities, but on domestic manufacturing and construction. There is a veritable consumer boom in Russia. House prices have nearly doubled in two years, and this despite accelerated construction. Nowhere is the seemingly insatiable domestic market clearer than in automobile sales. Last year, Russians bought 2.8m cars, 60pc more than in 2006, relating to some $53.4bn. Unsurprisingly, nearly all global car producers have moved to build assembly plants in the country. Agreeing with the assessment of a new, low-risk Russian economy, Garegin Tosunyan, president of the Association of Russian Banks (ARB), noted that as a smaller player on the global market, Russia does not carry the weight of risk of some of its developing colleagues. "Although we love to say that Russia, India and China jointly produce more than half of the world's GDP, Russia actually account for less than 3pc of that. There is a positive side to this, as global cataclysms cannot sink us to quite the same extent. The country is also able to make quick and profitable manoeuvres, offering attractive conditions for investment, especially as it has huge solvent demand and is responsive to investment." Of course, as recent economic history has shown, transitional economies are not traditionally attractive to investors in times of crisis. Indeed, the general rule has been that businesses remove assets from countries with insufficient credit histories in order to re-invest in US or other government securities. Today, however, world markets have turned this logic on its head; the once safe haven of the US can no longer guarantee stability and protection, let alone a returns. Thus, in Tosunyan's view, "never before have transition economies had the scale, potential and attractiveness of Russia". It would seem that many companies and business leaders are coming round to this view. The positive balance of capital inflow into Russia increased from $2bn in 2006 to $82bn in 2007, with foreign investment accounting for $47bn. According to minister Kudrin's projections, investment will grow by at least 14pc in 2008 and will double to $490bn by 2010. Meanwhile, investment Group Troika Dialog suggest that the average profitability of even the most conservative investment is some 15-20pc.